Hawkins clearly and succinctly presents the difference between being a manager and a true leader. Executive coach Mike Hawkins knows a lot about leadership—enough to fill six books, in fact. 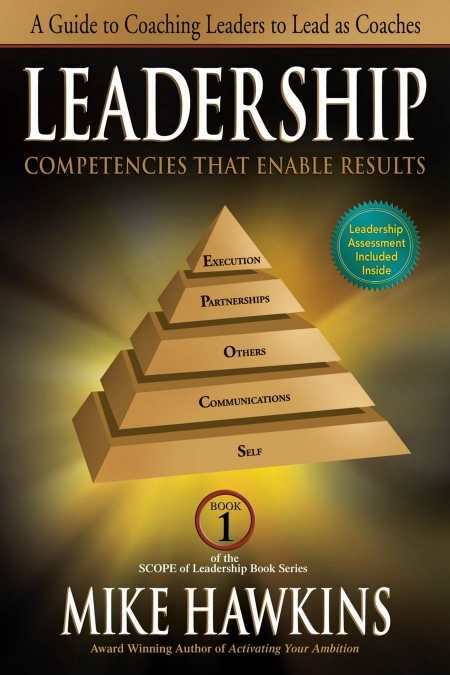 Leadership: Competencies That Enable Results is the first in a series built around a framework Hawkins calls “The SCOPE of Leadership,” an acronym for Self, Communications, Others, Partnerships, and Execution*. *This initial volume is an introduction to the series, laying out Hawkins’ basic concepts and principles of leadership. Subsequent titles address each of the five SCOPE areas in detail. Leadership opens by claiming great leaders are responsible for sustained performance at successful companies—but sadly, studies “find that the quality of leadership continues to fall and set new lows.” The book identifies the “top ten” reasons why there are few great leaders—among them, fear and insecurity, selfishness, and a focus on management versus coaching. This last factor forms the underpinning for the argument throughout the rest of the book that management and leadership demand two different perspectives. While this notion has been expressed by other leadership gurus, most notably Peter Drucker, Hawkins does a fine job of drawing a sharp contrast between managing and leading. In fact, he includes an excellent table that pinpoints the differences between a “contributor, manager, and leader,” a valuable reference for anyone aspiring to become a leader. The book is divided into chapters that cover the need to lead, choosing to lead, learning to lead, trends that affect leadership, and leadership competencies. “Disruptive Trends Affecting Leadership” is perhaps the most forward-thinking chapter. Here, Hawkins details several trends he says cause “resistance to old approaches to management.” He points out, for example, that money is no longer the primary motivator in work; rather, it is meaning. People “want to perform work that is meaningful and aligned to their values,” writes Hawkins. As a result, managers need to engage, involve, and appeal to employees in new and different ways, different from the past. Written clearly and succinctly with excellent use of tables to supplement the text, Leadership includes two superb tools leaders can use to improve their own competencies. The first is an assessment keyed to the five SCOPE leadership categories. The second is a template to plan development activities and track improvements made after reading the next five books in the series. Of course, the tools are also a clever way of encouraging further reading, as is the section that lists both contents and tables of each subsequent book. It is likely that anyone who wants to be a modern day effective leader will have much to gain by reading this first book in the SCOPE of Leadership Book Series.